I made this last night out of a whim and desperation because I didn’t have the ingredients for what I intended to make. It turned out great, so here is the “recipe,” such as it is. A little bit of ginger, black pepper, and salt. I just shake things in randomly, sorry! Grease baking sheet if it’s not non-stick. Mix garlic and oil in one bowl. 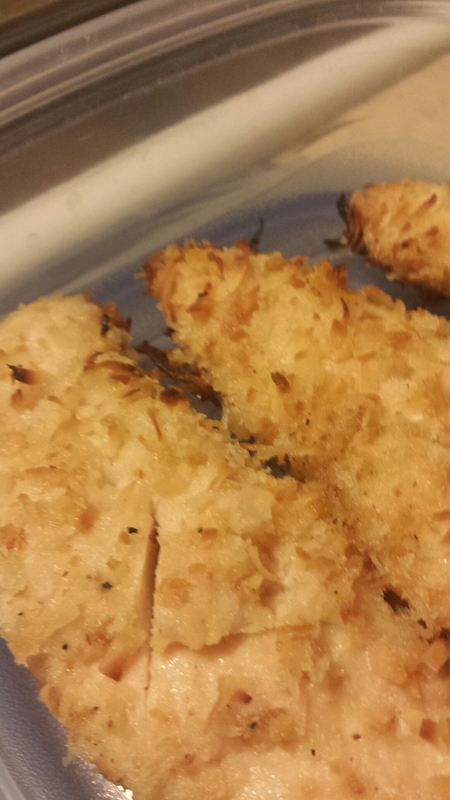 Mix panko, coconut, ginger, black pepper, and salt in another bowl. 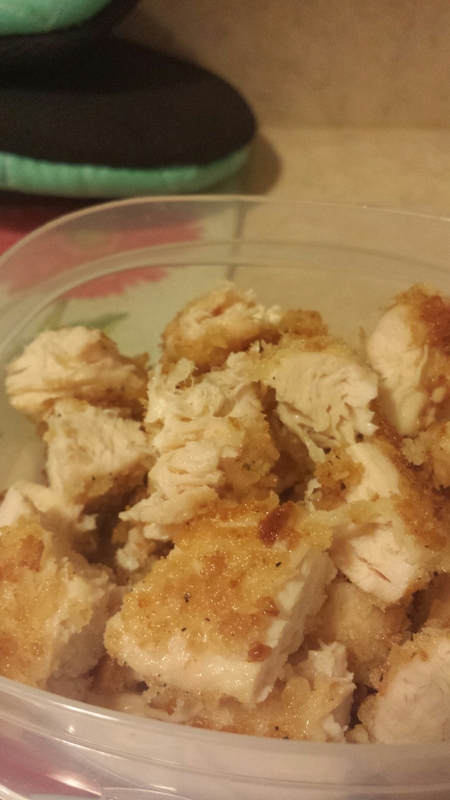 Dredge chicken pieces in garlic/oil mix and then dip in topping mix. Flip around to evenly coat both sides. Bake 20-30 minutes. For chicken strip sized pieces, I would check after 20. For thicker chicken breasts, probably after 30. Really depends on your oven. Mine is evil and likes to just pick its own temperature I’m convinced. 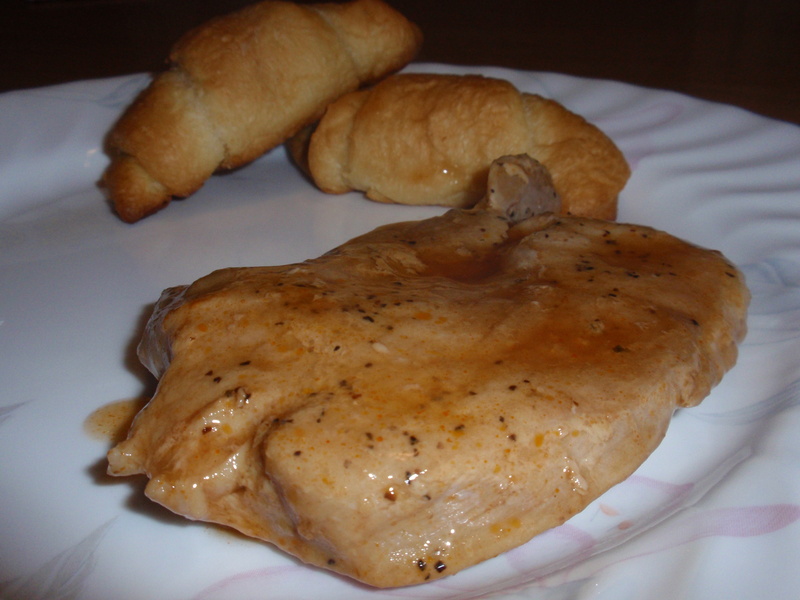 Great as chicken fingers with an Asian dipping sauce or chopped up and put into a salad! 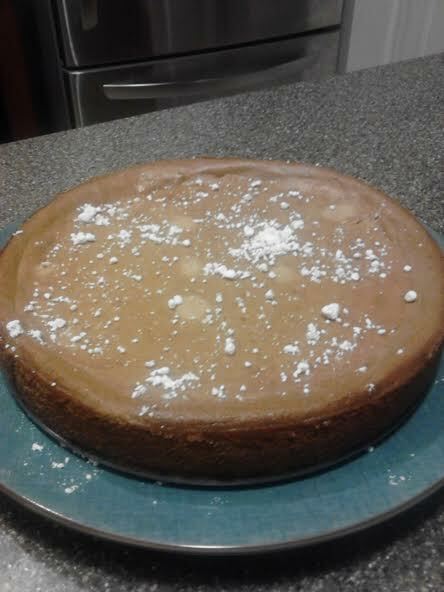 I make some variation of pumpkin cheesecake every year for Thanksgiving. 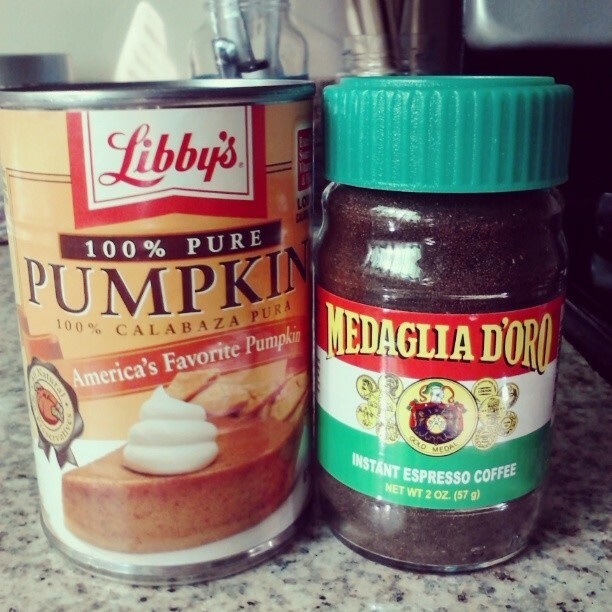 This year, my friend suggested making a cheesecake version of a Starbuck’s Pumpkin Spice Latte. I loved the idea and headed straight to Pinterest. Of course, it had been done before (as all good ideas have) and the recipe I selected is from Sprinkle Bakes. This cheesecake was super easy to make, and turned out delicious! Preheat oven to 350 degrees. Crush up vanilla wafers. I do this in a big ziplock bag using a random jar or bottle to smash the cookies. I cannot tell you how many vanilla wafers to use, because I just eyeball it. Just go crazy! Mix with the melted butter. Press into the bottom (not up sides) of a 9-inch spring-form pan. Bake 8-10 minutes. Cool completely. Using an electric mixer, combine the cream cheese, 1/2 cup of sugar and vanilla in a medium bowl and mix until smooth. Mix eggs in one at a time, blending well after each addition. Remove one cup of the mixture and transfer to another bowl. Dissolve espresso powder in a very small amount of hot water and stir (just enough water so it dissolves and isn’t grainy). Add the espresso to the 1 cup of filling and mix until batter is uniform in color. Set aside. Blend 1/4 cup of sugar, pumpkin, cinnamon and allspice into the remaining filling. Pour the pumpkin mixture on top of the crust in the spring-form pan. Top pumpkin mixture with the 1 cup coffee filling mixture. Bake for 55 minutes or until filling is set. The cheesecake will puff up in the middle a little bit as it bakes and then relax back down as it cools. I let it sit in an open, turned off oven for about 20ish minutes before taking it out. This helps it transition from temperatures and not crack on top. Run a knife around the edge of the pan for easy un-molding. Allow the cheesecake to cool before removing rim of spring-form pan. Chill until ready to serve. You can get all fancy with the garnish–powdered sugar, dollops of whipped cream, cinnamon sticks–whatever screams “Pumpkin Spice Latte” to you! I was feeling a little lazy at this point on Thanksgiving, so I just sprinkled some powdered sugar on it and called it good. I apologize for not having a better photo of this. We ate it too fast for me to get any good photos. It was just that delicious. Press crushed Oreo cookies into bottom of 10-inch spring-form pan. Bake 5-6 minutes or until set. Do not burn! Cool on wire rack while preparing cake. Reduce oven heat to 300 degrees. Beat softened cream cheese, sugar and vanilla until smooth and creamy; add eggs one at a time beating well after each addition. Divide batter equally between two bowls. Melt 1 cup semi-sweet chocolate chips; stir into one of the bowls of cheesecake batter; pour batter into crust prepared pan. Microwave peanut butter until soft, about 20-25 seconds; stir into other bowl of cheesecake batter and pour on top of the chocolate layer. Bake cheesecake at 300 degrees for 50-60 minutes or until center is almost set (not jiggly). Do not overbake. Don’t worry if there are a couple of cracks. They will come together when refrigerated and we’re covering it in chocolate anyway. Place pan on cooling rack; cool approximately 1 hour. Carefully run a knife around edge of pan and remove sides of pan. Place cream in a microwave safe bowl and heat for one minute or boiling. Pour chocolate chips into cream and let sit until soft. Stir until chips are melted and mixture is smooth and creamy. Pour chocolate over top and sides of cheesecake. You may want to place your cheesecake on a cookie sheet to catch the run off. 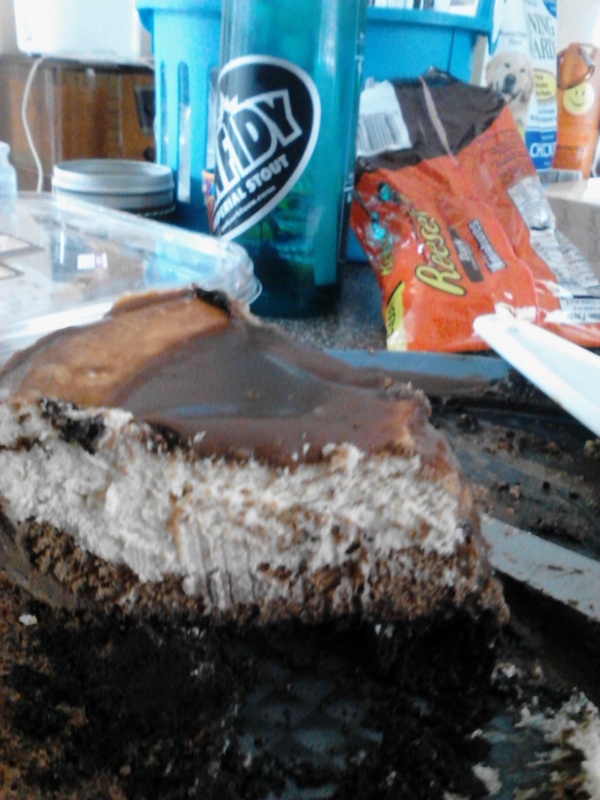 Refrigerate overnight; cut optional Reese Peanut Butter cups into quarters and garnish top of cheesecake. Refrigerate leftovers. I am very excited to announce that my friend Vicki has started a food blog and invited me to write a guest post for Dessert Week over on her blog, Mind, Body & Belly! YUM. Head over to her blog and check out the recipe! 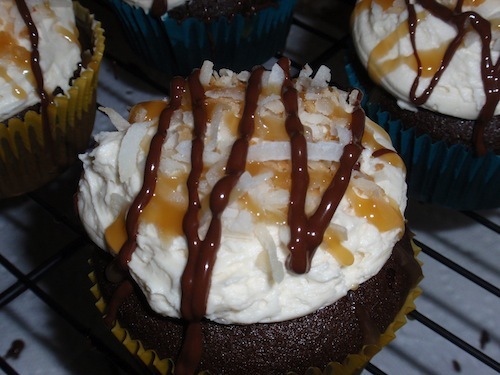 While you’re there, be sure to sign up to follow her blog for more great recipes!